Hardwood and conifer swamps, thickets, wet shores, meadows, river banks, ditches and swales, marshes, and bogs. In much the same diversity of wet habitats as the equally common S. galericulata, but the latter seems more often to be in open places and S. lateriflora more often in shaded ones. Plants with white corollas, f. albiflora (Farw.) Fernald, are rare. Depauperate plants very rarely have the racemes reduced to a single flower, but are identifiable by the very small size of the flowers together with petiolate leaves. Plants intermediate with S. galericulata, with intermediate-shaped petiolate leaves and larger flowers (ca. 10–12 mm) than in S. lateriflora, borne singly or in few-flowered racemes, are presumably hybrids, S. ×churchilliana Fernald. 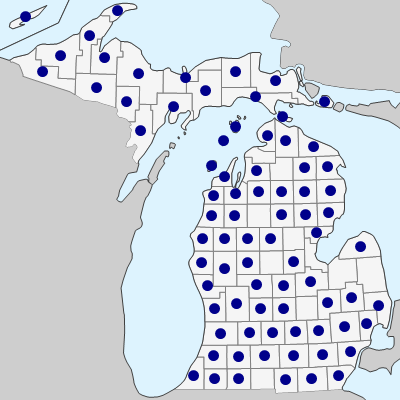 The only Michigan collections seen are from Gogebic and Marquette Cos.
MICHIGAN FLORA ONLINE. A. A. Reznicek, E. G. Voss, & B. S. Walters. February 2011. University of Michigan. Web. 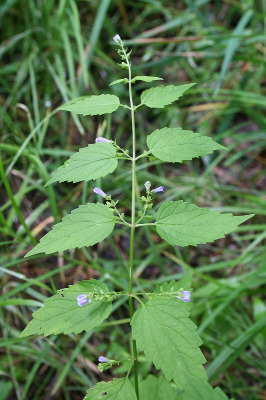 April 19, 2019. https://michiganflora.net/species.aspx?id=1596.